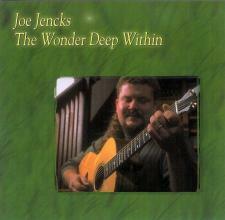 While Joe Jencks has performed professionally for nearly twenty years, his first all-spiritual recording, The Wonder Deep Within, was released in the summer of 2004. It met with critical acclaim from fans and reviewers alike. Observer Magazine said, "This recording is a profoundly spiritual statement, and it will go far in helping many people move toward the spiritual centers of their own beings." The reviewer continued, "Joe's voice, so unique in its combination of strength and vulnerability, power and sweetness, is the perfect vehicle for these songs." In 2004, Joe won the prestigious Walnut Valley Music Festivals' songwriting contest in the category of "Songs of Religion and Spirit." The winning song is the title track off this recording, The Wonder Deep Within.